Discover is one of many organizations that recruit Redbirds for internships. Many students participate in an internship to gain experience or as part of a degree requirement. However, students gain more than academic credit while interning. According to the National Association of Colleges and Employers 2018 Students Survey, nearly four-fifths of students who responded to the survey who also had an internship and/or co-op said their professionalism and work ethic was “very,” or “extremely” improved by the experience. Interns develop vital transferable skills such as career management, professionalism, leadership, critical thinking, collaboration, and oral and written communication. In fact, Career Center Partner Discover Financial Services is well known for its commitment to Redbird internships. One of the company’s missions is to help people achieve a brighter financial future. One way they have done that is to contribute to a thriving workforce. Redbird information systems major Tyler Block found that his internship at Discover taught him to work with others in a way he had not experienced through the classroom alone. During his internship, he worked as a member of the company’s Cyber Security Department. Block’s internship helped him to develop his communications and collaboration skills. 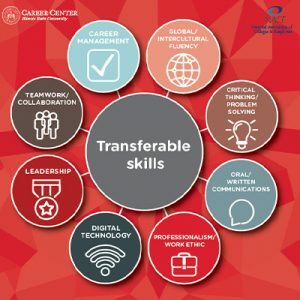 Communication and collaboration, also known as “transferable skills,” are competencies that employers seek in candidates that go beyond coursework. The Career Center encourages students to develop their transferable skills during an internship. Redbird cybersecurity major Nathan Stukenberg learned a lot about the networking during his internship at Discover as well. “An internship is a great opportunity to network with people, not only with other managers and workers but with other interns. Plus, you will learn what the company is like and if the culture is for you. It also, gives you a great idea of what you want to do in your life and can open up new pathways that you never thought were available,” said Stukenberg. Kris Bajkowski ‘15 interned with Discover in 2014 and was hired to work full-time with the organization after graduation. Today he serves as Discover’s Senior Associate of the Business Technologies Campus Programs. He works with interns throughout the year and reiterates the value of communication and networking in their roles. “Our most successful interns have great curiosity and they ask questions frequently. When you are a brand new employee at a big company, it is imperative to ask questions so you understand what you are working on. 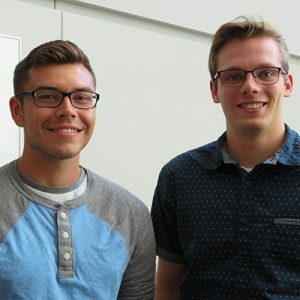 I always encourage our interns to ask as many questions as they can, even if it’s about small details– the sooner they get into the habit of asking questions, the better off they will be,” Bajkowski said. Internship experience alone is not what helps students succeed in their careers. Academics are essential as they can reflect one’s knowledge, and also other skills and expertise. “Keeping your grades up is a very important factor, and having a good GPA shows employers that you can understand complex concepts, have good time management skills and can work under pressure,” Bajkowski said. The combination of academic excellence, practical experience, and transferable skills such as communication and networking are just a few of the benefits NACE states that can come from an internship—whether paid or unpaid. Students who seek to build and develop their transferable skills to progress toward a career of their dreams should consider participating in an internship. Illinois State provides many opportunities for Redbirds to explore internships. Students can meet with their career advisor to learn more about the value of internships or explore actual internship opportunities by attending the Spring Internship Fair on February 19. Recruiters from numerous organizations and industries, including Discover Financial Services, will be seeking Redbird talent from all majors who are interested in pursuing internship experiences. The Career Center assists students with developing, evaluating and/or implementing career, education and employment decisions and supports Educate Connect Elevate: Illinois State—The Strategic Plan for Illinois’ First Public University 2018-2023.